Last summer in an attempt to become more environmentally friendly we replaced our gas-powered mower with a Brill RazorCut Premium 33 Reel Mower. The spinning blade of the reel mower works purely from the power of whoever is pushing it. In the beginning, this mower served our needs very nicely. We relied on it for mowing the lawns in both the Entrance Garden and the Terry Shane Teaching Garden. The reel mower worked beautifully when the lawn had been mowed weekly and there was no debris in the lawn. We started to have problems with this mower when we received a lot of rain. Because of the rain we were unable to mow as frequently as we like and the lawn got longer than we would normally allow it to. This caused the spinning blades to get clogged up. During the fall and at other times of the year when leaves, twigs, and beech capsules would get fall onto the lawn, they would cause the blades to jam. So, this year we began to look for a more reliable alternative to the reel mower. My friend and colleague, Robert Herald had told me that he had purchased a cordless electric mower. 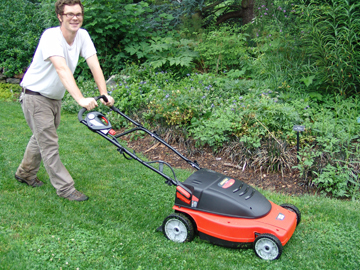 While visiting his garden in Swarthmore, he demonstrated the use of this new mower. I was impressed at how well it cut, how easy it was to start, and how relatively quiet it was compared to a gas-powered mower. The brand and model he bought was the Black and Decker 24-amp, 19″, Cordless Electric Push. We ended up purchasing the same model for $359.00. 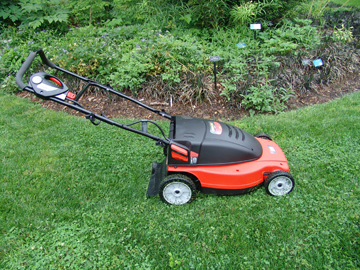 Its operation is very simple: plug it in, charge it overnight, unplug the cord, press the starter handle, and mow. You don’t have to pull a cord to get it started. It does come with a bag for the clippings, but we have decided to use it as a mulching mower thus returning the clippings to the lawn as organic matter. Love my cordless electric mower too! Sounds great, but how about mowing 2 1/2 acres in one fell swoop! Speaking of cordless gardening tools, I have a Black and Decker blower, nice and quiet and lasts about 15 minutes, just long enuff to blow grass cuttings and debris from walkways and terraces. I have a small lawn and I use push reel lawn mower for detaching.I don’t prefer electric lawn mower.The electric lawn mower is best for the medium size of lawn.